Kenneth Gibson was a meek and mild fifty five year old university professor who was unmarried, and who had no plans to change this. That is until he met the daughter of one of his colleagues. Mr. Gibson had the gift of empathy, and when he met Rosemary James at her father's funeral, he felt that this young woman was exhausted from caring from her father. She was thin and tired and had been sheltered from the world. Mr. Gibson felt that he could help her to recover. Indeed, he did. Under his care, Rosemary flourished. They grew fond of each other and finally agreed to marry despite the differences in their ages - she was 32 and he was 55. They settled down in Gibson's pleasant home, and all went well until they had a traffic accident. Rosemary was driving, and when she swerved to avoid an oncoming car, she instead ran into it. Mr. Gibson was seriously injured with several broken bones in his leg, but Rosemary was not injured. When Mr. Gibson was released from the hospital, his sister Ethel came to help Rosemary take care of him. Ethel was unmarried and had been successful in her career. She was a dominating person, and managed to see the worst in everybody. She saw that Rosemary was quite friendly with Paul Townsend, their next door neighbor. Ethel did not hesitate to tell Mr. Gibson about this. Gibson took her quite seriously and believed that he was losing his wife to the younger, attractive neighbor. He was also depressed about his inability to walk without limping. He was still off from his teaching position which gave him time to brood. Mr. Gibson decided to commit suicide. He went to the laboratory of a fellow professor, found the poison he would use for his suicide and poured some of it into an olive oil bottle. He put the bottle in a green paper bag, and took the bus home. When Mr. Gibson got home, he realized that he had left the bottle on the bus. He called the police, and he and the police then set out to find out what had happened to the poison. This hunt is remarkably suspenseful. 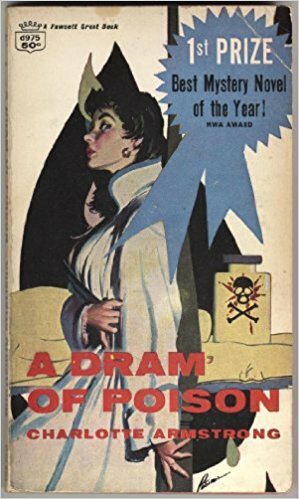 This book won the Edgar award in 1957, and it was the fourth novel to do so. It was originally published in 1956. The book was interesting, and the hunt for the bottle keeps the reader's attention. There is also a lot of speculation in the book about the causes of Mr. Gibson's reasons for suicide. An assortment of characters, including a bus driver, a society matron, and an artist, is added to the hunt, and their speculations cause Mr. Gibson to engage in a great degree of soul searching. I could not resist wondering about how a modern mystery writer would handled this situation. I have read this book for the 2018 Just the Facts, Ma'am Mystery Challenge. 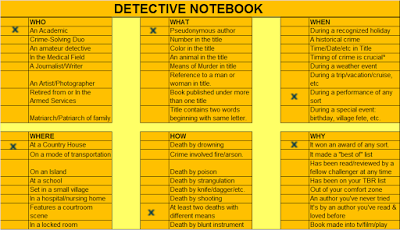 In my detective notebook, it is in the category Why - won an award of any sort.